Westinghouse has introduced a number of LED-based LCDs this year, in screen sizes from 42 to 55 inches. As with Westinghouse's traditional CCFL LCDs, these LED models are aggressively priced for the budget-conscious consumer. We have not performed a hands-on review of the 46-inch LD-4655VX, which was released earlier this year, but here is a more comprehensive look at its features. This TV has a 1080p resolution, edge LED lighting, and 120Hz technology to reduce motion blur; it lacks higher-end options like 3D capability, Web services, and WiFi-readiness. The LD-4655VX uses the Yamaha AudioEngine LSI for audio reproduction, which is designed to improve low-frequency response and enhance dialogue. Its edge LED lighting allows for a slender depth of 2.14 inches and excellent energy efficiency. The TV is Energy Star-certified, and Westinghouse says that it consumes about 80 watts during use and only 1 watt in standby mode. The packaging uses recycled and recyclable materials and soy-based inks. 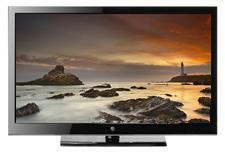 • Read more LED HDTV reviews from the staff at Home Theater Review. • Find Blu-ray players in our Blu-ray Player Review section. • Learn more about HDTVs at HDTVetc.com. The connection panel is fairly lean, offering just two HDMI inputs, one PC/VGA input (with a mini-jack audio in), one composite A/V input, and one RF input to access the internal tuners. You also get optical digital and stereo analog audio outputs. The HDMI inputs are side-facing for easy access. The LD-4655VX lacks a component video input, a network connection, and a media-friendly port like USB or SD. (There is a USB port, but it's for service only.) Not surprisingly, the TV also lacks an RS-232 or IR port for integration into an advanced control system. Likewise, the A/V adjustments are lean. You can choose from five picture modes, three backlight options, and three color-temperature presets, and naturally you have access to basic controls for contrast, brightness, saturation, hue, and sharpness. Dynamic contrast is also available. The setup menu lacks precise white balance adjustment, color management, gamma, and other higher-end options. As I mentioned above, this TV has a 120Hz refresh rate to help reduce motion blur, but there are no customization options in the setup menu, nor is there a "smooth" de-judder mode. The LD-4655VX has four aspect-ratio choices, including a 1:1 mode to view content with no scaling. On the audio side, you get five sound modes, plus bass, treble, and balance controls. A Surround 3D function is available, but this TV lacks any type of volume-leveling control to minimize volume discrepancies between sources. Read about the high points and the low points of the LD-4655VX on Page 2.